A highly attractive Silver Plated Pendant. 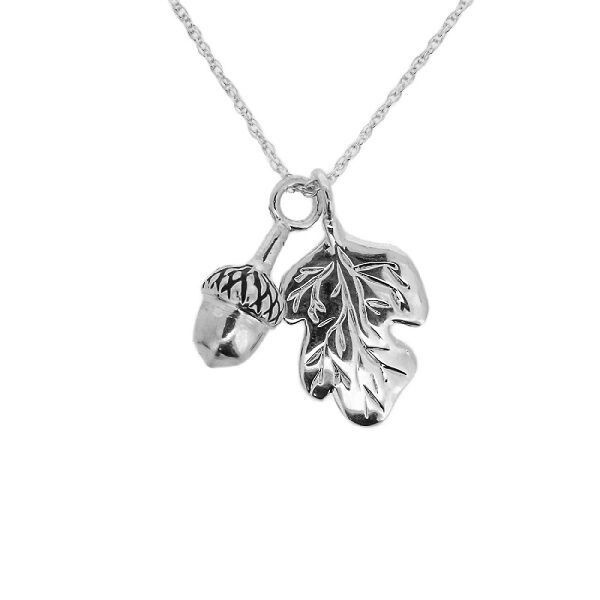 It features an Oak Leaf and an Acorn, used as a secret symbol by Jacobites, indicating their belief in the rebirth of the Jacobite cause. Finished in the finest Silver Plated, it comes with a 16" extendable to 18" Sterling Silver Chain, and is presented in an attractive black and gold gift box. This beautiful pendant will make an ideal gift, and a lasting momento, for someone who loves the heritage of Scotland. Size (approx) - Oak Leaf: 29.0mm x 13.0mm; Acorn: 19.0mm x 7.5mm.